"Our parents are involved in a business matter…" Magnolia Pictures has debuted the first official trailer for Ira Sachs' Little Men, a film about two boys growing up in New York City. I was a huge fan of Ira Sachs' previous film, Love is Strange, and while I didn't love this one as much as that film - I still suggest seeing it. Greg Kinnear stars as the father of one of the two boys, who are played by Michael Barbieri and Theo Taplitz; the full cast also features Jennifer Ehle, Alfred Molina, Talia Balsam and Paulina Garcia. This is a rather wonderful trailer that really does a great job of setting up the story and hopefully grabbing the attention of a few curious cinephiles. But then again, it's worth watching any of Ira Sachs' films. Enjoy. When 13-year-old Jake’s grandfather dies, his family moves from Manhattan back into his father’s old Brooklyn home. Jake befriends the charismatic Tony, whose single mother Leonor, a dressmaker from Chile, runs the shop downstairs. Soon, Jake’s parents Brian and Kathy ask Leonor to sign a new, steeper lease on her store. For Leonor, the proposed new rent is untenable, and a feud ignites between the adults. Children can’t avoid the problems of their parents forever, and soon enough, the adult conflict intrudes upon the borders of their friendship. 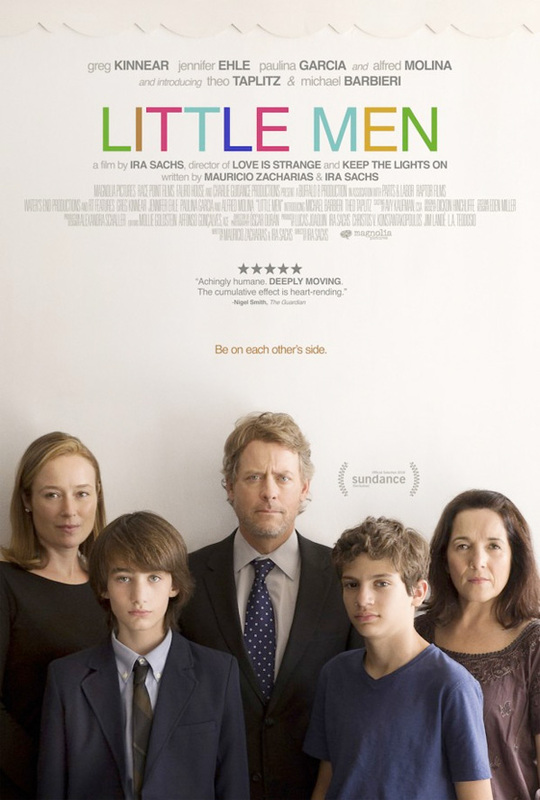 Little Men is written and directed by American filmmaker Ira Sachs, of films like Married Life, Keep the Lights On and Love is Strange previously. The film premiered at this year's Sundance Film Festival. Magnolia will open Little Men in theaters August 5th. Support indie films. Second great trailer today (besides the Accountant). This looks wonderful. Greg Kinnear continues to impress. Feels quite real. And that's a good thing.